It doesn’t surprise me that Tokyo leads. I think a lot more international families live there. Okayama is holding onto average. We are the countryside. That is what I have to work with. Not Tokyo, it’s Chiba setting the pace! It’s interesting that Yamagata is well below the average for JHS but above the average for HS. I can’t imagine that the students themselves get relatively that much better compared to the rest of the country in just three years. 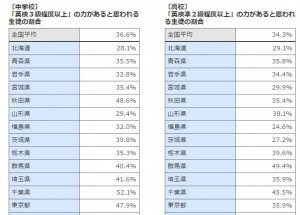 The best high schools in Yamagata are public, but wouldn’t private school students be counted as well? Maybe not…. No, I think the article says public junior and senior high schools. These results are completely unreliable! Not every student takes the test, so results like legoboy mentions above are bound to happen. One cannot make any legitimate comparisons. Regardless, your points about poor JTE proficiency, and better tests (which would naturally provide more accurate data, ie. separate scores) are spot on. Heh. 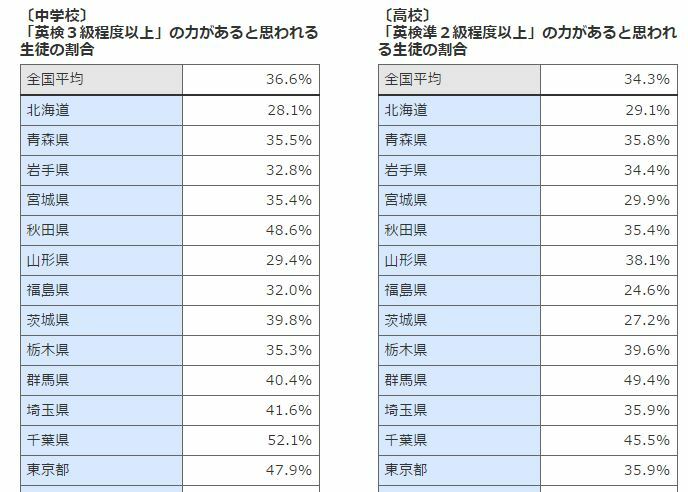 It’s even less reliable than that, because I just noticed the Japanese article doesn’t say these are students who have PASSED the test, but rather students with a ‘level equivalent to’ as assessed by their teachers.